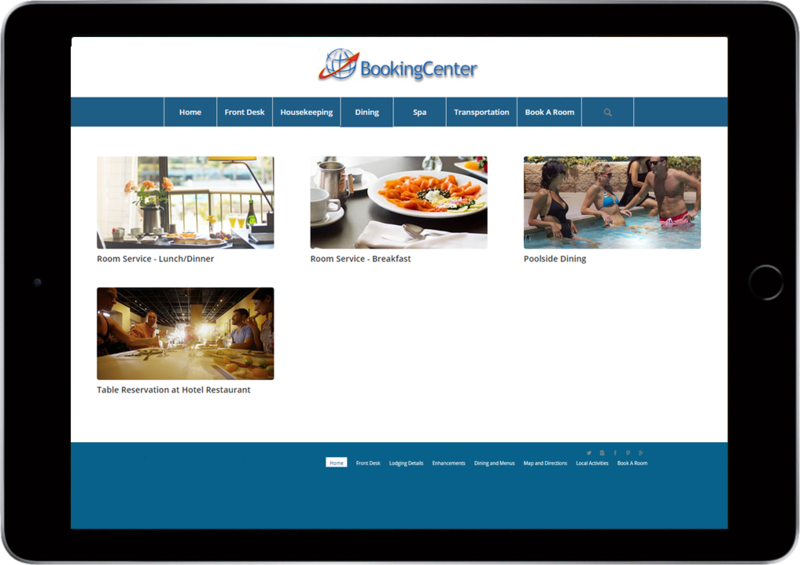 BookingCenter’s MyGuest is a cloud-based, fully automated Request Tracking System for hotel staff with an integrated ‘Concierge’ website for guests. Your staff will never miss a beat! Every request displayed on the interactive dashboard making it easy to assign staff, respond to guests and track request progress. Use the Manager’s App for immediate notifications and updates. Real-time incident tracking for your property. 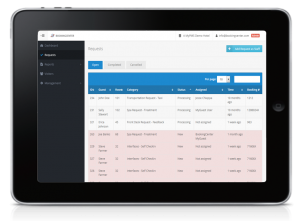 Perfect for hotel staff to track and review requests and maintenance logs with up-to-the-minute analytics and Incident Reports. The automatic ‘escalation’ feature makes sure Requests are resolved in a timely manner. With the MyGuest Manager App, get immediate alerts and notifications when guests check-in, digitally signs a document, needs assistance or submits a request. Our Downloadable iOS app let’s key staff receive immediate alerts via ‘push’ notifications and monitor requests in real-time from anywhere via a smart phone. MyPMS – MyGuest integration offers a complete solution for tracking requests, guest activity and enhancing communication throughput the booking process. New MyGuest Requests are displayed on the MyPMS Dashboard and stored with the Guest Booking for easy retrieval. 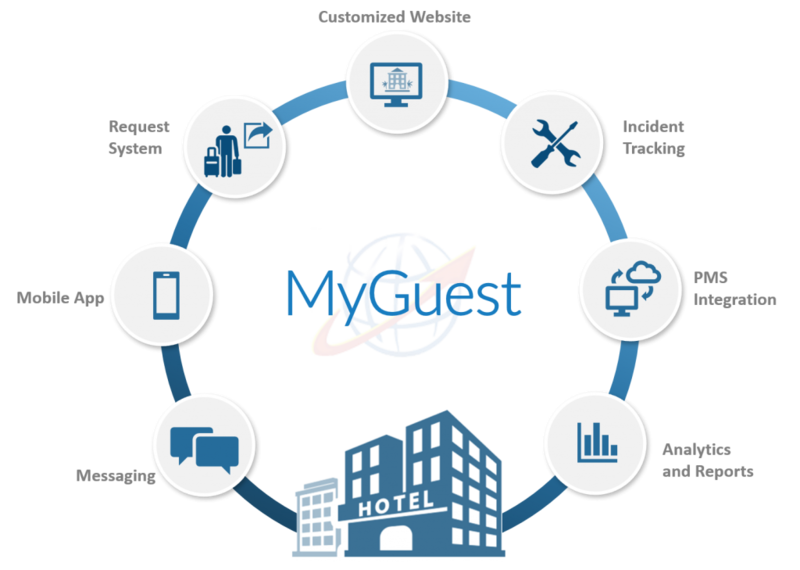 MyGuest can also be used to track Digitally Signed Documents, Self Check-in progress and SMS Messaging using ‘push notifications’ to notify staff, as well as manage any error such as a Guaranteed By credit card declined, a room not assigned, cancellation, or Guest editing their details. Make it easy for guests to engage and interact with your property and staff. MyGuest can be launched quickly, with minimal training and no impact on your most precious resources – your staff. And, when paired with our Property Management System, the ability to track Guest requests – and automate their fulfillment – will mean more time to oversee daily activities. Our team will help get your property up and running with a beautifully branded mobile guest request and service tool in no time! Contact us to get started! Provide superb service to your guests from anywhere at anytime. 24-7 guest services available from your guests’ own digital device. Guests can communicate with you, explore your venue and your local area on any desktop or mobile device. No need to download anything. 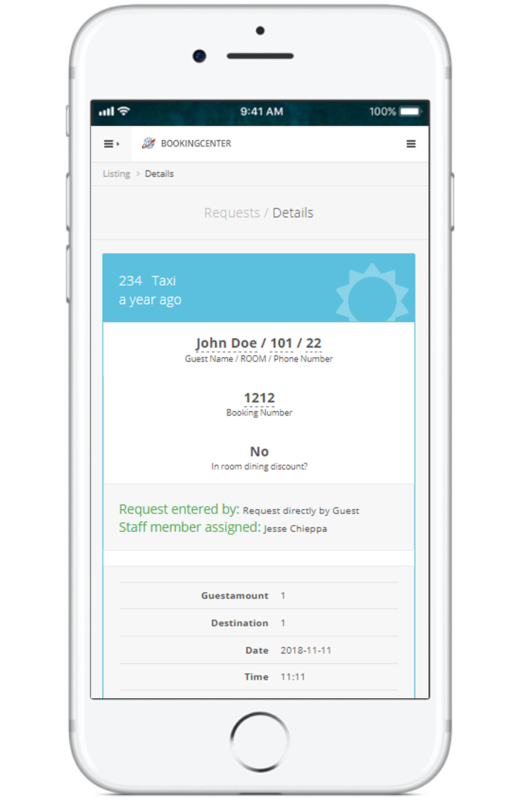 BookingCenter comes with a downloadable iOS /Android app for key staff for immediate alerts via ‘push’ notifications of new incoming guest requests. Enables you to monitor your guests’ requests in real-time while roaming the property or from anywhere via your smart phone. Every single request is captured and displayed in an easy-to-follow online dashboard. Your staff will never miss a beat – all open/active requests are fully visible and staff can be alerted to new entries via ‘push’ notifications. Up-to-the-minute charts and graphs display activity in visual format. 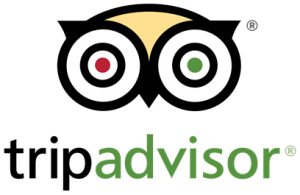 With one-click access to your property’s TripAdvisor listing, you can maximize the opportunity to secure great reviews. Want more ‘likes’ and ‘followers’? Increase your brand awareness & brand advocacy. 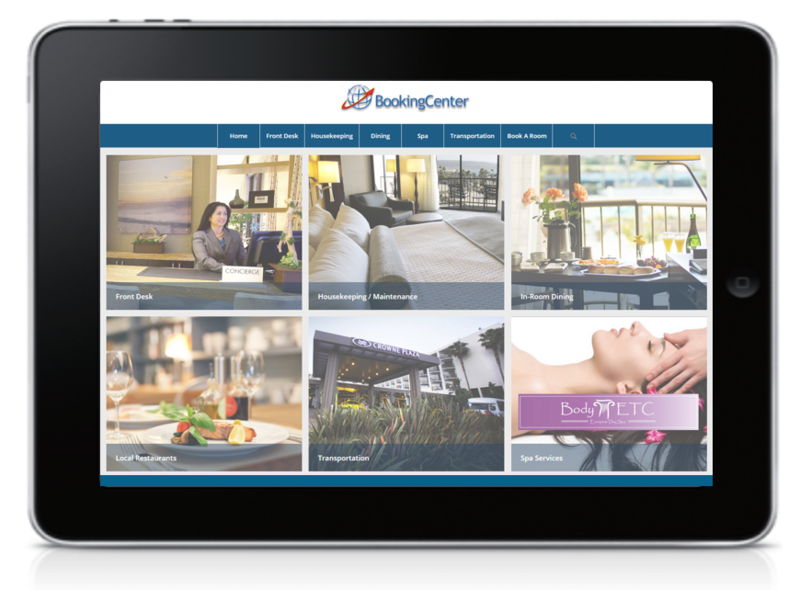 Your properties social media profiles are woven into the BookingCenter product experience. Facilitate increased engagement from your guests during their stay. Choose the MyGuest System that is right for your property. MyGuest can be enabled as a ‘stand alone’ service or integrated with MyPMS. The Full Concierge builds on the Request Tracking system with a customized, visually-stimulating hotel website as a ‘Concierge’ where Guests submit request and book services, 24-7, via any device – laptop, phone or tablet. From pre-arrival to in-house, provide your guests with access to commonly requested items like Housekeeping, Maintenance needs, Dining requests, transportation and other local services. Our CMS enables you update the content seen by your guests immediately without the need to re-print menus, hotel compendiums or place signage around your venue. The Interactive Dashboard and Managers Reports will show you which services are being requested, and how well each staff member is fulfilling their duty. Easily search for requests, users and create downloadable Reports. The Request Tracking gives you a real-time incident tracking system with every request captured and displayed on an easy-to-follow online dashboard and sent to the Manager’s App (iOS and Android) so staff is alerted via ‘push’ notifications, email, and/or SMS. 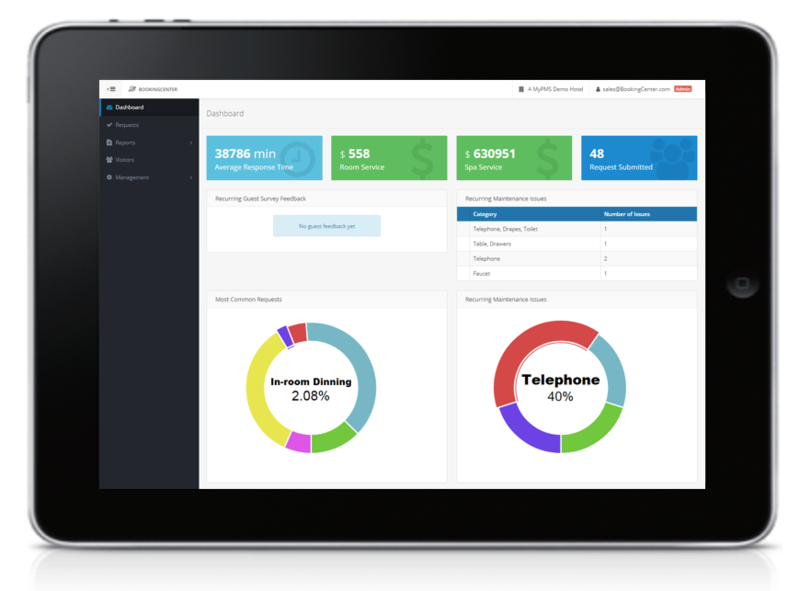 Your staff will never miss a beat and you will have an easy-to-analyze incident report of all issues affecting your property, with up-to-the-minute charts and graphs displaying activity visually. 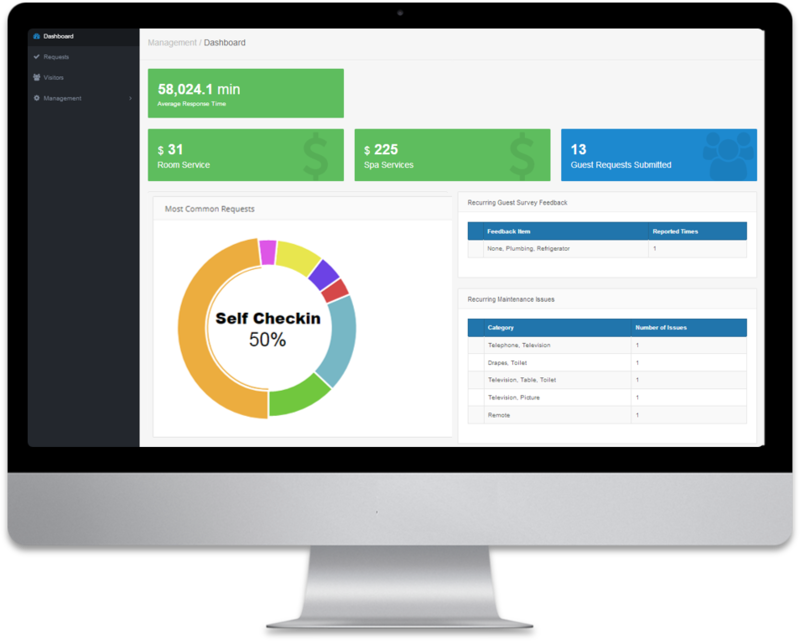 With our Interactive Dashboard and Manager’s App, you will know which staff was contacted to perform which service, how long it took, and whether or not it was fulfilled. The automatic ‘escalation’ process will alert other staff and/or management via ‘push’ notifications. Hotel Incident Reports are created automatically, with graphs showing relevant details and will show you which services are being requested, and how well each staff member is fulfilling their duty. Our team will help get your property up and running with a beautifully branded mobile guest request and service tool in no time! MyGuest is 100% cloud-based and can be launched quickly. 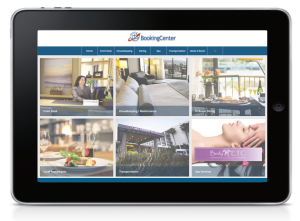 Your dedicated BookingCenter Training Specialist will work with you to tailor your MyGuest System to your hotel. We will help customize your implementation, and provide support and guidance as your property changes and grows with MyGuest. Easily access and search our Online Manual for step-by-step instructions, Knowledge Base for answers to FAQs and video tutorials on how to use features. 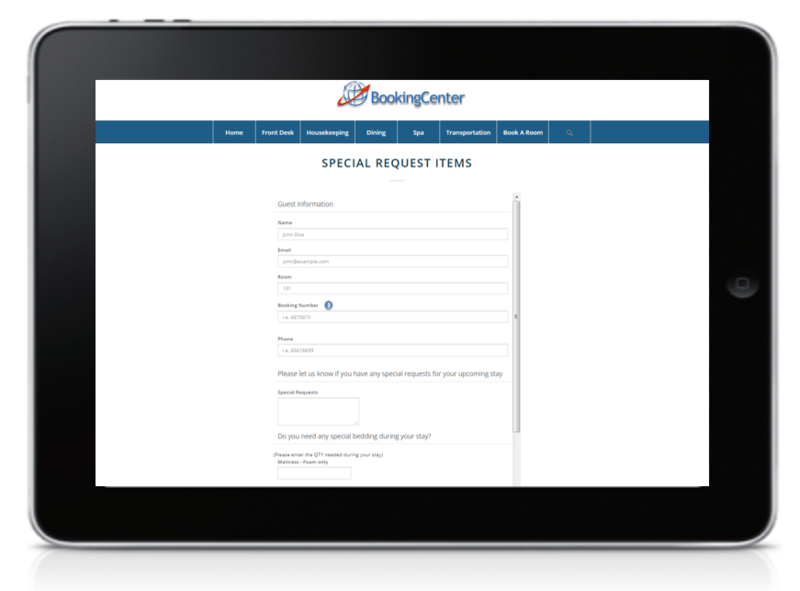 All BookingCenter customers receive 24 x 7 technical support and updates.